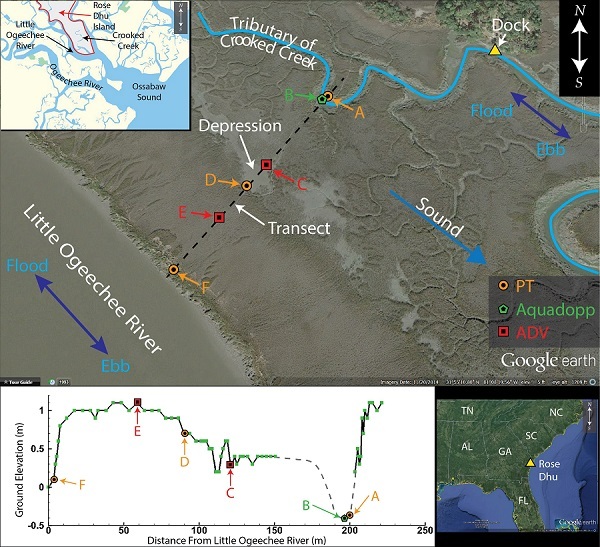 This dataset along-stream velocity, cross-stream velocity, and estimated pressure gradient at station E located at an oyster reef in Wassaw Sound, Georgia from November 3rd to 6th, 2014. The equipment used was an Acoustic Doppler Velocimeter (ADV, Nortek Vector – Nortek AS, Rud, Norway). ADVs measure the fluid velocity at essentially a point in the flow. The ADV measurements have a resolution of 1 mm/s and were collected continuously at 1 Hz. Pressure Transducer - The equipment used is an Onset HOBO pressure transducers (PTs). The PTs measured absolute pressure and temperature every 30 sec. The PTs were housed in custom-made PVC stands. The stand’s aluminum plate prevented instrument settling during the deployment cycle and the bolt/dive-weight assembly fixed the vertical elevation of the PTs within the stand. The three PTs were surveyed daily with static GPS for at least two hours. Additionally, a GPS base station, located on the nearby fixed dock, was surveyed daily for at least eight hours to improve GPS vertical elevation accuracy during post-processing. The GPS antennae were Ashtech Duel Frequency Marine Antenna (Ashtech S.A.S., Carquefou, France) that were connected to either Ashtech ProFlex 500 GS or Z-Surveyor receivers and were programmed to record internally at 10 sec intervals. The water salinity was measured near the surface from the dock (Fig. 1) at 4:15 PM on November 3rd, 2014 and 11:35 AM on November 6th, 2014 and was 25.7 and 26.3, respectively. ADV - Data collected during low tide (determined by instances of the PT at station D being dry) were discarded. Following the recommendations of Chanson et al. (2008) and Wilson et al. (2013), data for which the average correlation coefficient of the three beams was less than 70% for 45 consecutive samples, or for which the average over 300 samples of the mean correlation coefficient of the three beams dropped below 70%, were discarded. This filtering predominately removed data collected while the instrument was not submerged, and less than 2% of the submerged instrument data were removed due to filtering. The dominant flow direction (if one was present) was determined for each ADV. An ellipse was fit to a scatter plot of the measured east and north velocity components for each ADV, and the major axis of the resulting ellipse is defined as the “along-stream” flow direction. Correspondingly, the minor axis is defined as the “cross-stream” direction. Sound waves that hit particles far from the profiler take longer to come back than waves that strike close by. By measuring the time it takes for the waves to bounce back and the Doppler shift, the profiler can measure current speed at many different depths with each series of pings. (More from WHOI instruments listing). current profiler (Nortek Aquadopp HR-profiler). A pressure sensor is a device used to measure absolute, differential, or gauge pressures. It is used only when detailed instrument documentation is not available. Water level from the ADV at station C (ADV07). This is assumed to be equal to water level at the pressure transducer at station D (PT-D). pressure gradient (meters of drop in water level per meter of horizontal distance).